Have you taken a break from running: Taking a break from me is synonymous with getting injured. Usually, a week or two on my spin bike and I am back on my feet. Training shoe: I’ve been working my way through the On Running lineup. Those and Hokas are great for saving your knees. Coach or training group: Most Wednesdays you can find me at the Lincoln Memorial with November Project. It’s a great workout with a great community. See you at 6:20. The hardest race you’ve ever run: After a surprising third-place finish at the 2010 North Face DC 5k I thought it was a natural seagway to use some expiring frequent flier miles to run the North Face’s National Championship Race in California for my first marathon. The 50-miler and 50-km went out first and tore up the course in the rain. I struggled running up the five peaks of the mountains in shoes completely caked with mud, but I also loved it. Most adventurous decision you’ve made with your running: In 2012, I had been training for the Chicago Marathon. A couple of days prior to departure my wife started having contractions with our first child well ahead of the due date. We talked and I ended up going to the race. Her mom came down to be with her. My mom flew up with me to Chicago. If my phone rang during the race my plan was to peel off from the course and take the subway to the airport where I would catch one of the hourly flights back to DC. Fortunately, I didn’t have to wear my race gear on the flight and had my best marathon time that day. My daughter ended up arriving on her due date, which was the same day as the Marine Corps Marathon and Hurricane Sandy. Have you dealt with a major injury: I’ve been very fortunate in running that I’ve stayed healthy. In other sports, I haven’t been as lucky. Doctors weren’t sure if I would regain use of my left arm after a freak soccer accident. I later nearly lost vision in my right eye due to a football collision. Running mentors: It’s a strange answer, but my running mentor would be my high school wrestling coach. After I injured my left arm and was told by doctor’s everything I probably couldn’t do I decided to challenge myself. Coach Billy Puckett taught me dozens of life lessons on perseverance. In two years I went from having limited mobility in my arm to wrestling in the regional championships for one of the top programs in the state. His lessons translate to all parts of my life, especially competitive running. My favorite place to run in the D.C. area is: The November Project workouts have us sprinting up and down the steps of the Lincoln Memorial, and the view coming down never gets old. Favorite local trail: Burke Lake is my favorite trail for regular training, which can also be paired with Lake Mercer for longer runs. When I need to break it up I like the Billy Goat Trail A, B, and C. It provides a nice flat trail along the canal, but also some cross-training with the rock scrambles and climbing. My best race was: My best individual finish to date was a second place at the North Face Endurance Challenge in 2016. I also won the team competition of the DC Biathlon twice. Favorite local race: The GW Parkway Classic and the North Face Endurance Challenge are tied for first. Both are well run and have great courses in their own way. Unfortunately this year they are both on the same day. Ideal post-run meal: As I’ve gotten older I realized the importance of refueling with whole foods after my long runs are key to recovery. Basically, stay away from anything with a label. Favorite flavor of gel, gu, etc: Nuun tablets and a Clif Bar are usually tucked away somewhere on me. Pet peeve: Folks that wear headphones with the music so loud they can’t hear what’s going on around them frustrate me. At an Ultra in Colorado, I tried warning a guy about a rattlesnake, but he never heard me. Goals: I’m trying to do a marathon in every state. I’m currently 12 states in, which serves as a testament to a lot of training and a supportive wife. 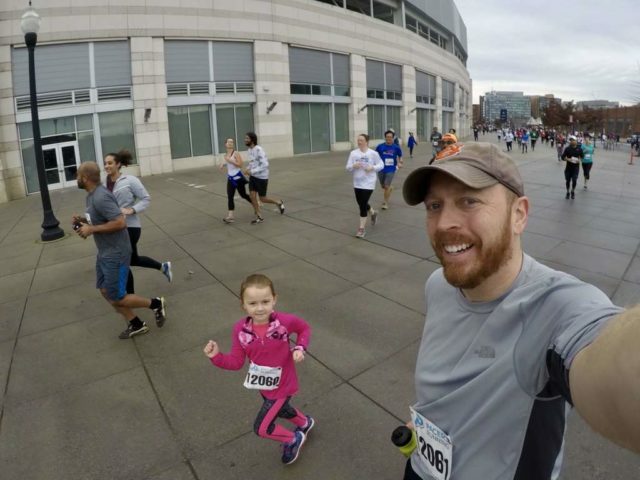 Your advice for a new runner: I have two daughters that are getting into running. I try to focus them on just enjoying it and not to get too concerned about their times. There are lots of distances and events available to find your niche. Favorite running book: If you’re 30’ish read Ultramarathon Man by Dean Karnazes. If you’re going on 40 or an aspiring vegan read Bethesda-native Rich Roll’s Finding Ultra. Song in your head during a run: The first song on my running playlist is “Love the Way you Lie” by Eminem and Rihanna. Running quote: “Some people are meant to run fast. I’m meant to run far.” My then-4-year old daughter after getting smoked in the 100 and then dominating the mile in her first track meet. Why is the D.C. area a great place to be a runner: DC and the surrounding areas have amazing trails that allow you to escape the city with very little effort. Everywhere you look is another epic view; whether it be on the Mall, the Mount Vernon Trail, or Rock Creek Parkway.